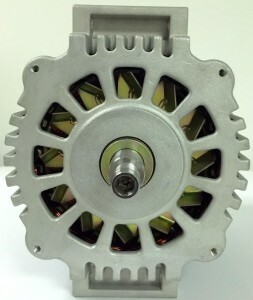 New patented technology: The unique use of permanent magnets enables the high output Eco-Tech 305-I alternator to generate 260 Amperes (135 Amperes for 28V versions) at 1,800 Alternator RPM as compared to 2000 RPM, the idle speed most often quoted by competitors. 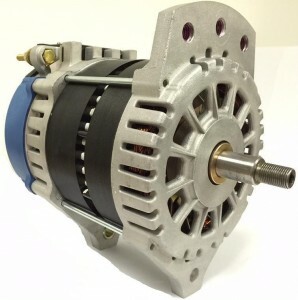 This high-at-idle alternator is a unique solution to achieving high output at low RPMs. A current claw pole alternator would have to be rated at a minimum of 700 Amperes to produce the comparable Eco-Tech low RPM alternators 260 Amperes at idle. Typical competitors’ 320 Ampere rated alternators deliver 85-90 Amperes at idle, about 1/3rd of the Eco-Tech high amp alternator. Eco-Tech 305-I Alternators satisfy most vehicles’ electrical loads at engine idle without a Voltage decrease while also decreasing operating costs. 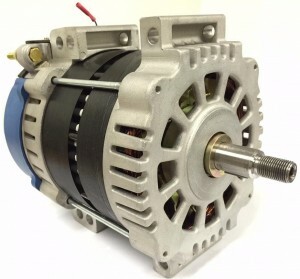 Alternator life and reliability are improved due to the ease with which Eco-Tech Alternators handle high electrical loads, such as supporting static inverters and magnetic brake retarders. Battery life is extended because of the elimination of battery deep discharge cycling that occurs during vehicle operation. Engine life is increased as a result of the elimination of high rpm operation that occurs when the high idle setting is engaged. Fuel economy improved while engine exhaust emissions and noise are reduced. 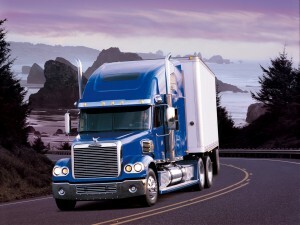 See the Fuel Savings Calculator. Eliminates the fuel penalty experienced during high idle operation (52% for the 7.3L Ford engine). What Is a High Amp Alternator? Not every vehicle requires a high amp, or high output alternator. A regular car, truck, or SUV typically performs well with the factory alternator already installed in the vehicle, as these types of vehicles use the same amount of electrical power, whether they are sitting at rest or driving down the road. Utility, emergency and other vehicles have a tendency to use the bulk of their electrical power while at idle, setting them apart from regular passenger cars. 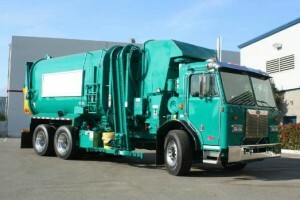 These types of specialty vehicles can include ambulances, utility vehicles, construction vehicles, shuttle buses, and school buses, among others. A factory alternator simply cannot bear the weight of this electrical energy, without taxing the motor, comprising the fuel efficiency, and wearing out the alternator. Alternatives such as the addition of additional batteries and stiffening capacitors don’t really help, and a high amp alternator is viewed as the best way to handle large electrical loads from specialty vehicles. A general high amp/high output alternator simply means that the alternator provides more amperage than a factory alternator. This doesn’t always help in terms of providing fuel efficiency and decreasing wear on the motor. What sets Eco-Tech high amp alternators apart from competitors is the alternators’ capabilities of generating higher amperage without increasing the RPM of the engine. A general high output alternator will provide more amperage, and in other words more power, but it will also increase the engine speed, proving itself capable of generating more power, but not being very useful in the long run. Eco-Tech high amp alternators are further set apart from the competition because not only do they handle an engine’s electrical output at idle without increasing the RPMs, an Eco-Tech alternator can also extend the battery life, the life of the motor, and increase fuel efficiency. Eco-Tech alternators are specially made to eliminate battery deep discharge during cycling, and have been shown to eliminate 50 percent of engine drag, thus boosting fuel efficiency.